Could the Mount Polley disaster have been prevented? It's a difficult question to answer, with an independent investigation of the tailings dam breach just getting underway. Certainly, concerns about the engineering of the tailings dam and the recent decline in mine inspections suggest the incident was not entirely unpredictable. But if we change the question -- if we look ahead and ask how similar accidents can be avoided -- answers are easier to come by. And they indicate it's not only tailings ponds that need to be changed; it's our whole approach to mining. Anna Johnston works at Vancouver-based West Coast Environmental Law to advance law reform proposals. She believes the philosophy of the mining industry needs a fundamental rethinking. "We need to have sustainability as the goal, not just minimizing harm," she said. Johnston said B.C. 's mining policy needs "a pretty serious overhaul," starting at the very beginning of the process, when companies stake their claims to mineral rights. She criticized British Columbia's free-entry system, which allows prospectors to explore for minerals on Crown, private, and First Nations land without consulting landowners. "Anyone with a computer and a credit card could stake a claim," she said. "And a mineral tenure takes precedence over private property and land-use claims. It's absurd." Johnston said we need laws that create "no-go zones" -- areas that are off-limits to mines, including sites near critical fish-bearing rivers. A precedent for this exists. In New Zealand, she pointed out, areas of particular importance to indigenous people are not included in mining permits. In Canada, recent changes to mining laws now require that companies in Ontario and Yukon consult with First Nations before exploring for minerals. Johnston also believes changes to B.C. 's Environmental Assessment Act, implemented by the BC Liberal government in 2002, may have played a role in the Mount Polley spill. She said Imperial Metals may not have had to submit environmental assessments for its mine expansions that caused more tailings to be discharged to the tailings pond. A 2010 report by the University of Victoria's Environmental Law Centre found that the 2002 Act only requires environmental assessments for mineral mines producing more than 75,000 tonnes per year, up from 25,000 tonnes in the original 1994 Act. Only expansions of more than 50 per cent of the original mine site would require a new assessment, up from a minimum of 35 per cent in the 1994 Act. Johnston said those thresholds need to be lowered, and the public needs a stronger voice in the environmental assessment process. B.C. 's Fair Mining Collaborative, a non-profit that advocates on behalf of communities and the environment, has recently put together a 400-page mining code that outlines changes needed at every stage of a mine's life, from consultation to compliance to closure. Amy Crook, the collaborative's executive director, said better enforcement of environmental standards could help prevent incidents like the Mount Polley spill. Reversing the decline in mine inspections would help, she said. But there are other things that can be done, too. "One of the things I think is lacking is a provision that would allow the public to request investigation for alleged infractions," she said. Such provisions are already in place in Alberta, Nova Scotia, Ontario, Yukon and the Northwest Territories. Crook would also like to see B.C. courts given the power to cancel a mining lease if the facility doesn't comply with environmental regulations, something that already exists in New Brunswick. Still, Crook recognizes that not everyone will be able to work through a 400-page volume. To that end, the collaborative has also published a shorter guide, to help people decide what questions to ask and what impacts to consider when a mine is proposed near their community. She hopes the documents will empower people by helping them understand what the best practices in the industry are, and what change they can demand from mining companies and their government. 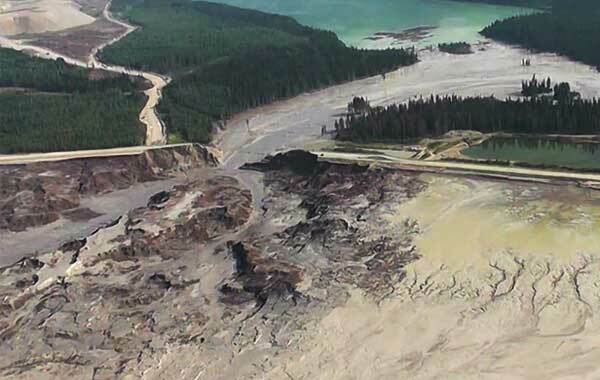 Of course, the Mount Polley spill has many focusing on how tailings ponds are built, and whether we need them at all. According to David Chambers, a geophysicist and president of the Center for Science in Public Participation, there are alternatives. Paste technology is used in a number of underground mines in Canada. The process works by adding thickeners to tailings to produce a paste, rather than the conventional mixture of water and solids. The paste can be stored in piles rather than in ponds that have the potential to leak. Various oilsands companies are also experimenting with drying tailings by vacuuming out the water or adding a flocculent, and then storing them in stacks. The technologies are substantially more expensive than conventional tailings storage, according to Chambers. He estimates that paste technology costs 50 per cent more than building a tailings pond, while drying the tailings costs two to three times more. "I don't think we can get rid of tailings dams," he said. But he does believe we can build them better. Right now, Chambers explained, tailings dams are built in a piecemeal fashion, because they're typically built from waste mine rock as it becomes available. That means different people may be in charge of dam construction at different times, with no continuity through the life of the dam. "This segmented construction lends itself to mistakes in quality assurance," said Chambers. "There's more opportunity for error." He said companies need to do better at ensuring that people who understand the dam construction continue to be involved throughout the project. Chambers also pointed out that there are three major types of tailings dams currently being used: upstream, downstream and centreline. Upstream dams use less material, but are more prone to collapse. Downstream dams use much more material, and are therefore more stable. Centreline dams, including the Mount Polley dam, are a compromise between the two. Chambers said upstream dams should be banned outright, and downstream dams should be favoured. Many of these recommendations involve policy changes that further regulate the mining industry. Meanwhile, most of B.C. 's recent changes to mining law have moved in the opposite direction. But some people hope that incidents like Mount Polley will spur mining companies to take voluntary steps to improve their environmental records. Aimee Boulanger, a co-ordinator at the Initiative for Responsible Mining Assurance (IRMA), is working to create a responsible mining certification that would be the equivalent of LEED or Forest Stewardship Council certification for the mining industry. "There aren't a lot of incentives to go beyond existing regulation right now other than goodwill," she said. She hopes the IRMA certification will make consumers demand products that are mined in an environmentally and socially sustainable way. IRMA has released a draft of its Standard for Responsible Mining, and is now looking for feedback from the public and the mining industry before publishing a final version. The organization hopes to begin certifying interested companies in late 2015 or 2016. Boulanger said the standards "go beyond existing law," but include practices that are currently being used by industry leaders. Not everyone is convinced by the certification idea. Johnston believes voluntary initiatives play "an important role," but said more is needed to ensure that mining practices improve. "The most valuable means of ensuring responsible development is strong laws," she said. "The laws that we have are the message we tell ourselves about what our standards and expectations are. Just crossing our fingers and hoping that industry will do it right isn't enough." So is there hope for a better regulated mining industry? Crook isn't sure. She worked on the Exxon Valdez oil spill years ago before moving to B.C. She said that disaster galvanized much-needed policy change in the petroleum industry.